Skip the coffee shop lines and save money by making your own drink at home. 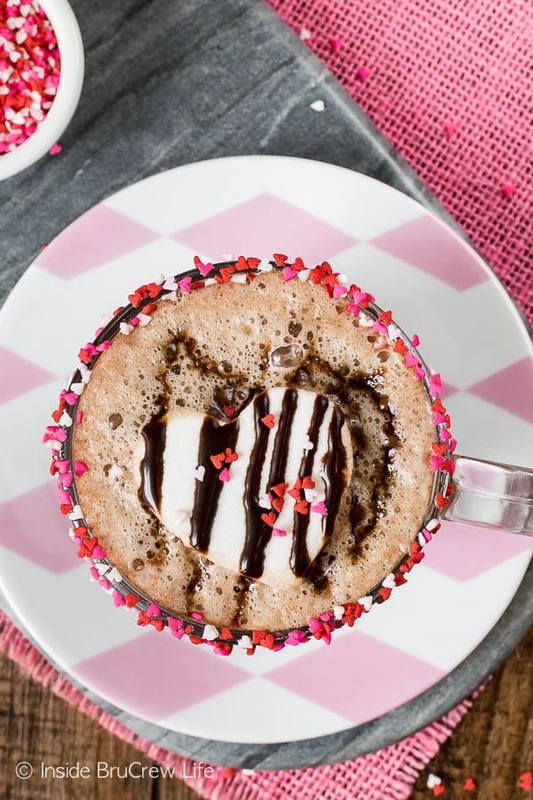 Two times the chocolate makes this Dark Chocolate Latte the perfect afternoon pick me up. My morning routine almost always involves a cup of coffee, a healthy breakfast, and some quiet time. It just gets me going and on the right track for the day. I can always tell the days that I don’t start the day out this way because things seem to bug and bother me more. I’m definitely a creature of routine. Even my warm hot sunny days start this way. I know, I know! Half of the US is covered in cold frigid snow, and I’m here talking about warm days. Well…I do live in Florida, so I’m walking around in shorts and tank tops and going kayaking and going to the beach in 80 degree weather. It’s a rough life, but someone has to live here. LOL! Some afternoons I like to take a break from baking and blogging and enjoy another cup of coffee. That’s usually the cup of coffee that I get creative with. Sure I like to go to different coffee shops and order their fun drinks, but I’m never a fan of the prices they charge. 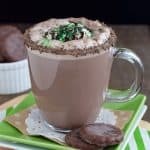 So, over the years I have made a thin mint latte, a s’mores latte, a rocky road latte, a salted caramel mocha latte, and a coconut Nutella latte in our kitchen using ingredients that I already had on hand. Booyah for saving money and enjoying a hot gourmet coffee drink. 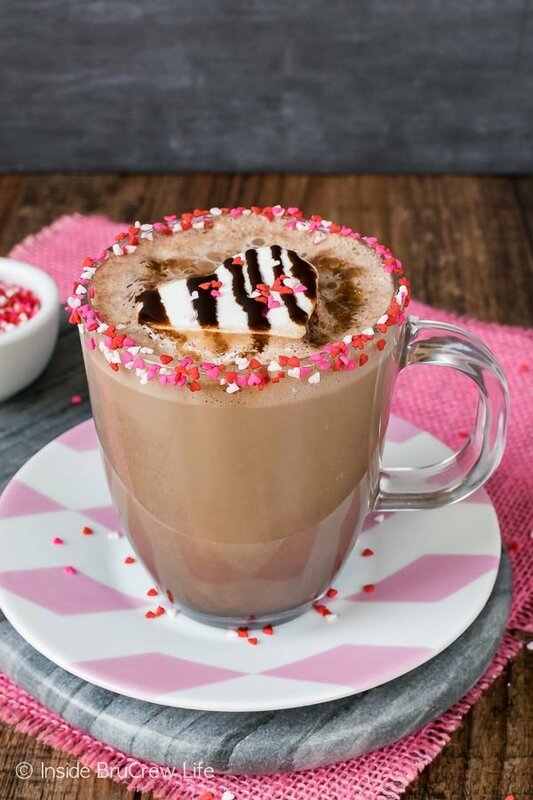 This week I decided to make a dark chocolate latte because it was Valentine week, and more chocolate is always a good idea. 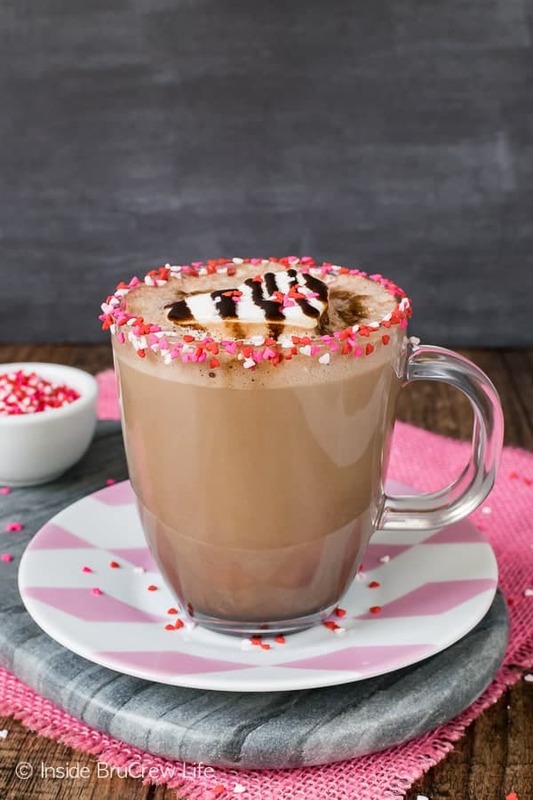 A rim of sprinkles and a heart marshmallow make this Dark Chocolate Latte so pretty and delicious. 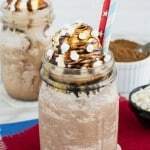 To give this drink an even bigger hit of chocolate, I topped it with frothed chocolate milk. Our kids love chocolate milk, so we always have a big container of chocolate syrup in our fridge. You can also buy it already made if you prefer. The sprinkles on the rim are totally optional, but you have to agree that it totally makes this drink so much more fun. Am I right? Just dip your glass in some honey and then in the mini sprinkles to give it a fun and colorful flair. The next time I sit down with my special coffee drink I want to make these raspberry funfetti scones from Beyond Frosting. I love all the sprinkles and fruit in each scone. I’m also thinking these chocolate chip scones from The Little Kitchen need to happen too. 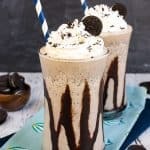 And then when it’s too hot to bake or enjoy hot coffee I’m definitely trying this homemade mocha frappuccino from Crunchy Creamy Sweet. Oh, yeah! Skip the coffee shop lines and save money by making your own drinks at home. Two times the chocolate makes this Dark Chocolate Latte the perfect afternoon pick me up. Stir together the milk and 2-3 Tablespoons chocolate syrup. Heat to a low simmer in a small saucepan. Use a handheld frother or blender to pulse until frothy. Dip the top rim of the glass in honey and sprinkles. Pour the coffee into the glass carefully. Top with the frothed milk. 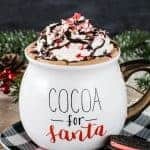 Add a marshmallow, chocolate drizzles, and sprinkles, if desired. Drink immediately. *You can use skim or fat fee milk to cut down on some of the calories. These milks do not froth as much though. 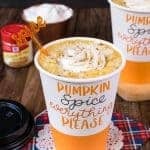 As if coffee wasn’t good enough before! 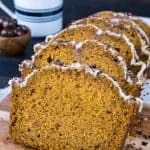 I’m drooling at my desk at work and counting down the minutes until I get to go home and make this! Thanks for sharing!! You had me at “two times the chocolate”. Love the love-marshmallow too! I love how dark and decadent this looks! plus, cocoa + chocolate makes this sound extra chocolate-y and perfect; also, thought the marshmallows were croutons for a sec lol but marshmallows make a lot more sense. Thanks for sharing such a nice post with us! !